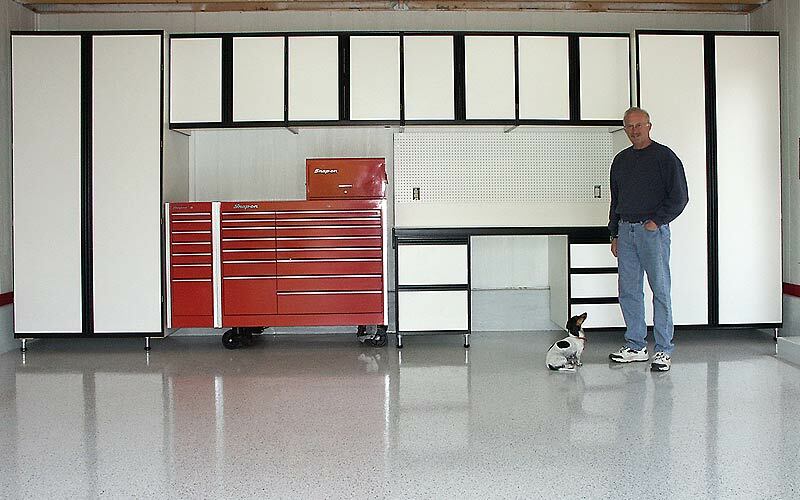 This set of cabinets was designed around the Snap-On tool chest the customer picked up at auction. Cabinet depth was adjusted to create flush alcove for tool chest. 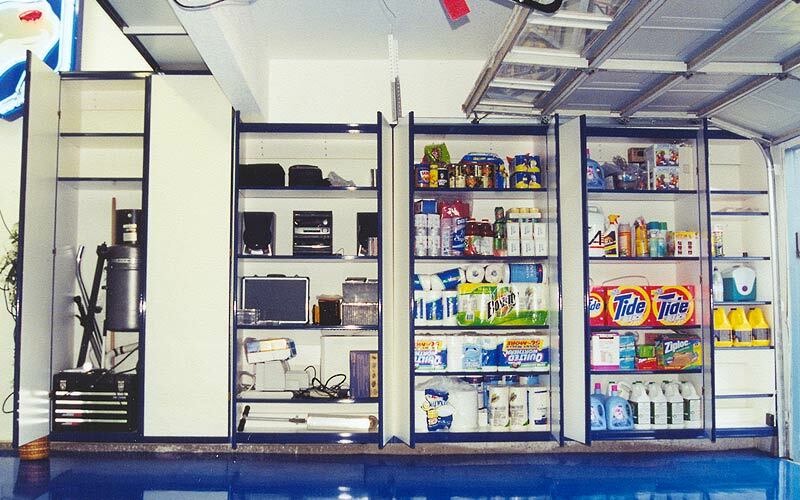 Extra deep drawers and slide out shelves were created to accommodate specific tools. 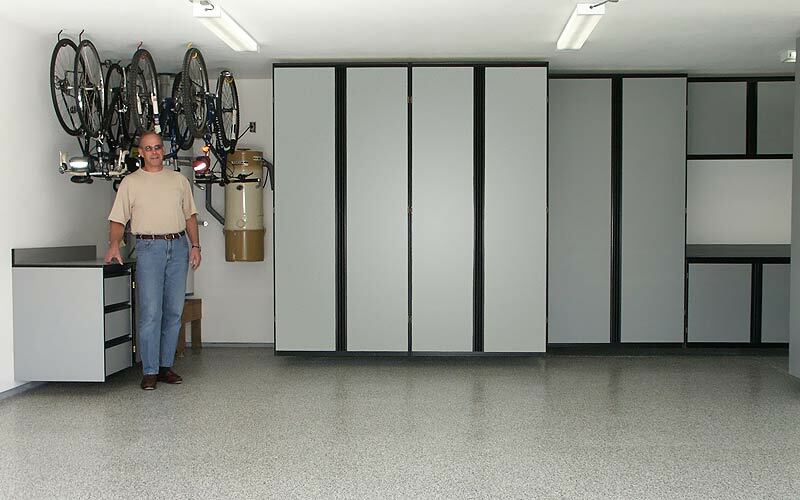 This striking garage maximized storage by covering nearly every horizontal surface with cabinetry. Overhead cabinetry was even installed on the back side of the ceiling beam shown in photo. Several floor to ceiling 12ft. 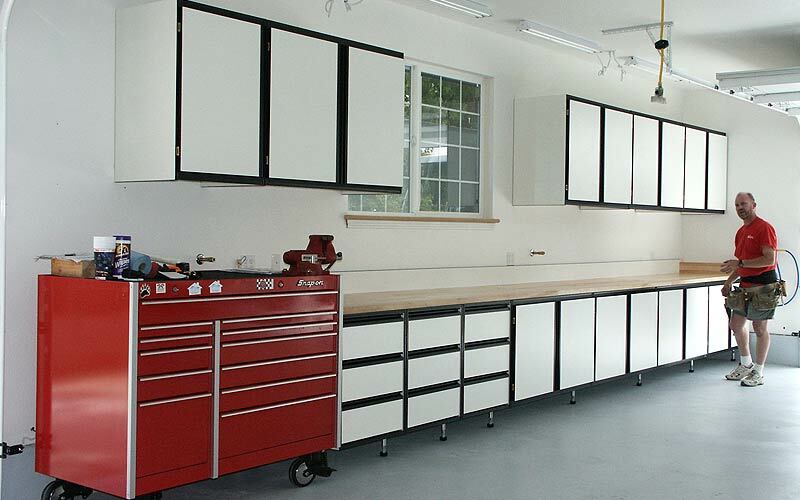 cabinets and solid maple butcher-block work benches highlight this garage. 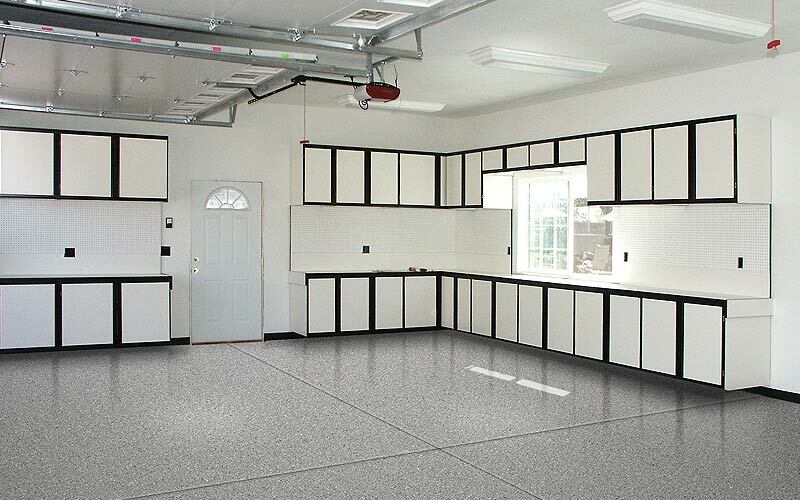 Huge counter-tops highlite this garage. Notice holes were cut in the melamine pegboard to accomodate power outlets. 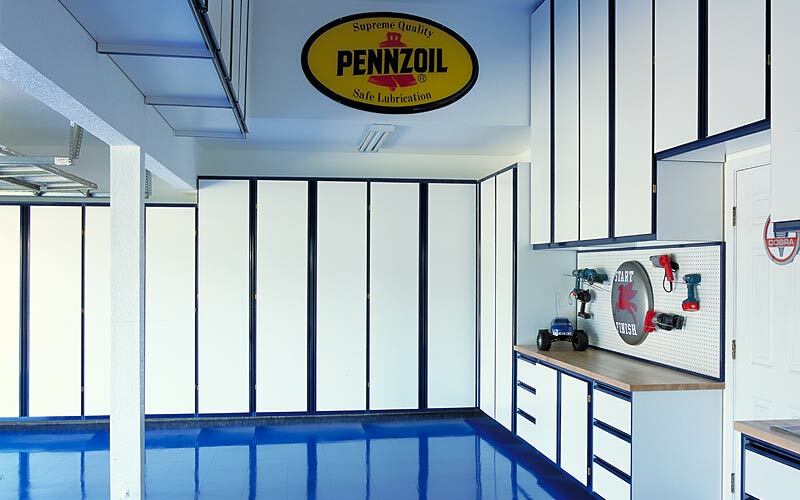 Custom cabinets were made to fit over windows. 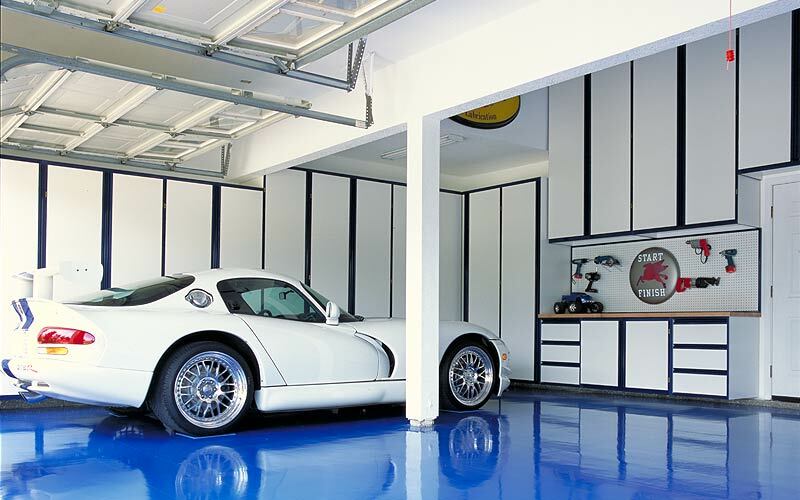 An epoxy floor is the finishing touch. Very nice! 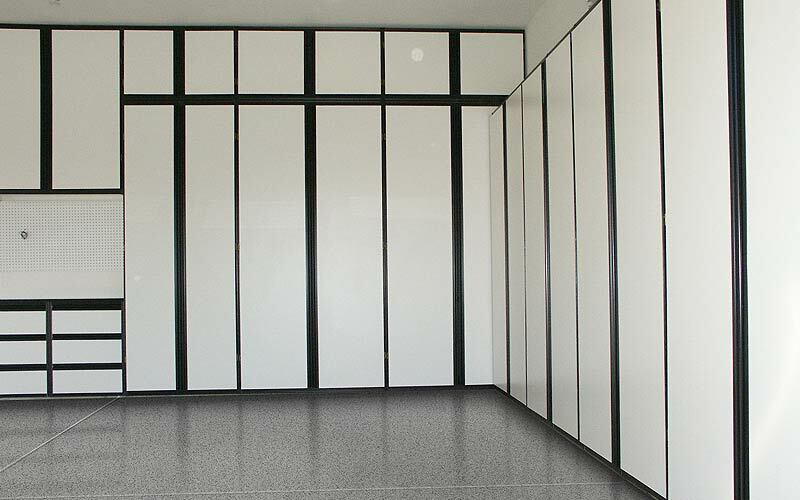 Clean lines highlight this design, along with a beautiful Granite Flake Epoxy floor. 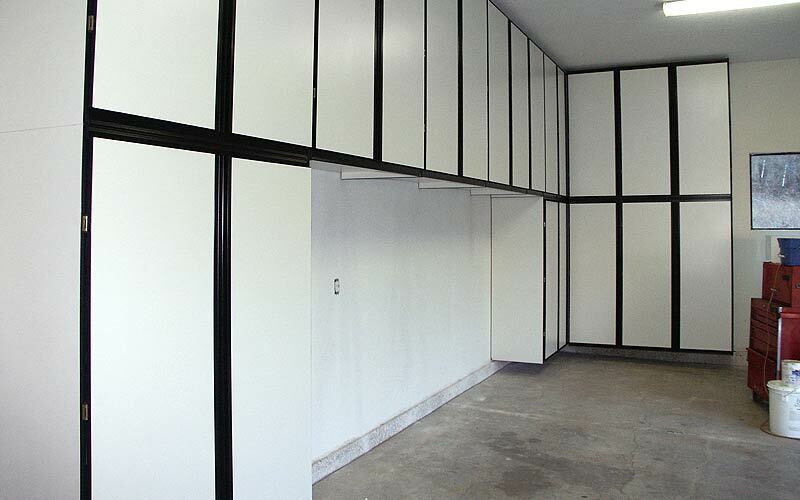 Only two cabinets needed to be custom sized from our standard dimensions to complete this design. 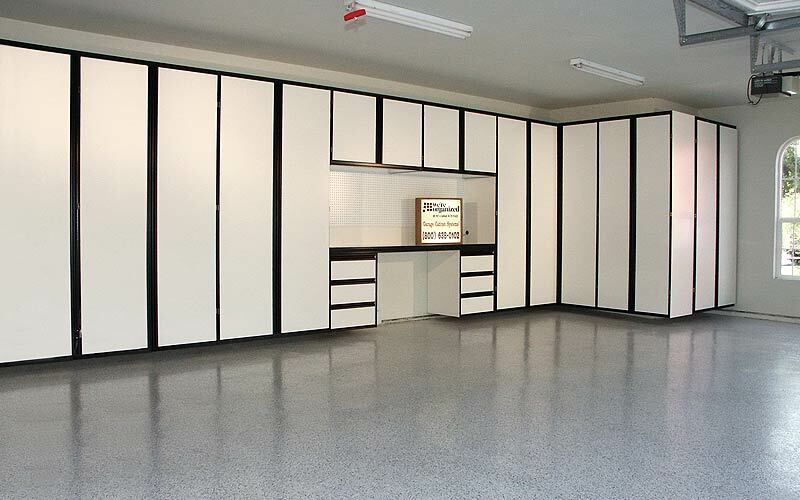 Almond colored melamine cabinets and a "Casemere" finish epoxy floor highlite this garage. 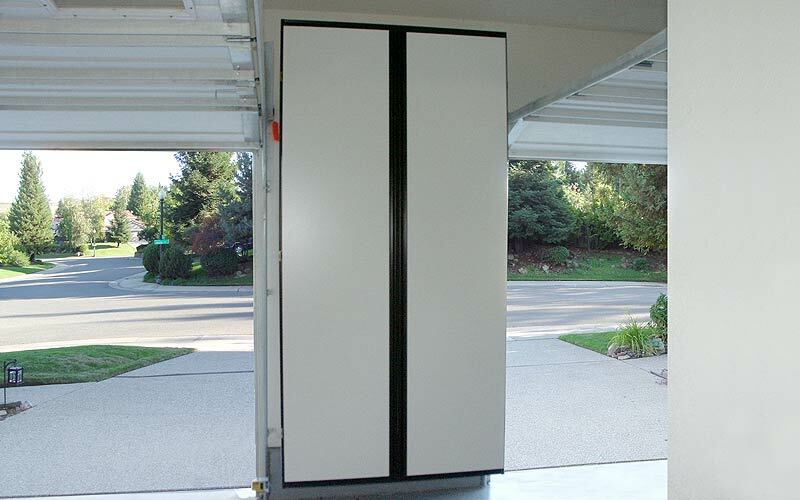 Notice the use of siding cabinet doors when cabinets are mounted behind garage door rail. 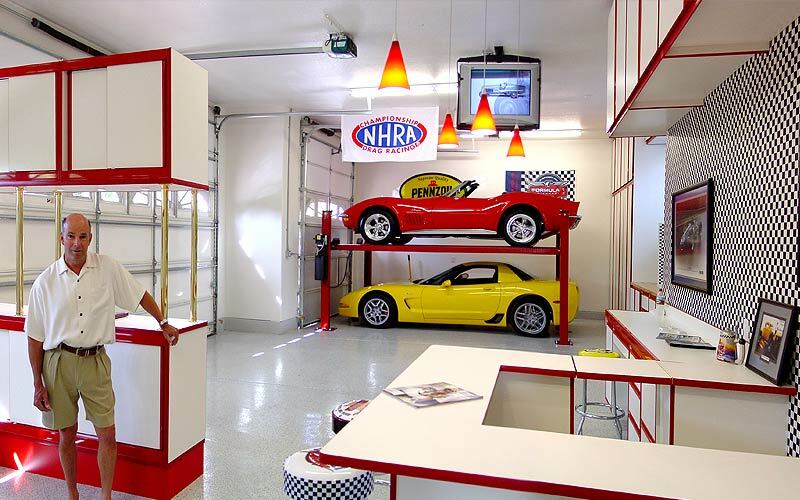 This ultimate garage features, red powder-coated aluminum extrusions, a walk-in bar, red melamine covered toe-kicks, a between bay island with brass pole supported overhead cabinets and down display lighting. Several floor to ceiling 12ft. 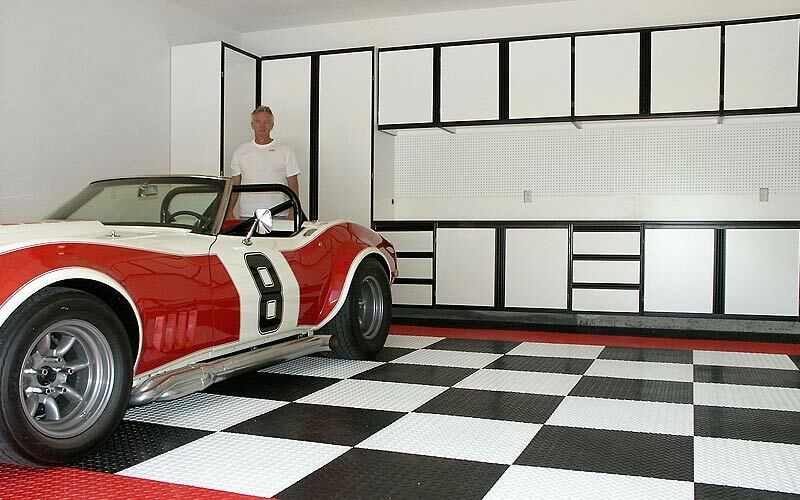 cabinets, solid maple butcher-block work bench and several very nice Vettes. 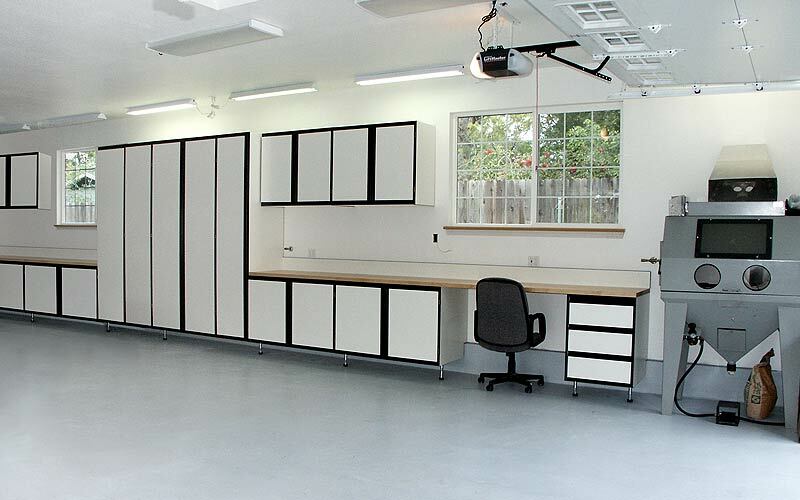 A working shop, this space featured 32 inch deep counter-top cabinets, with an unbroken 24ft. solid maple butcher-block top. Alcoves where designed into the layout for a beed-blaster and and other large tools. The owner included many nice touches, like retractable drop down power and air built into the wall. 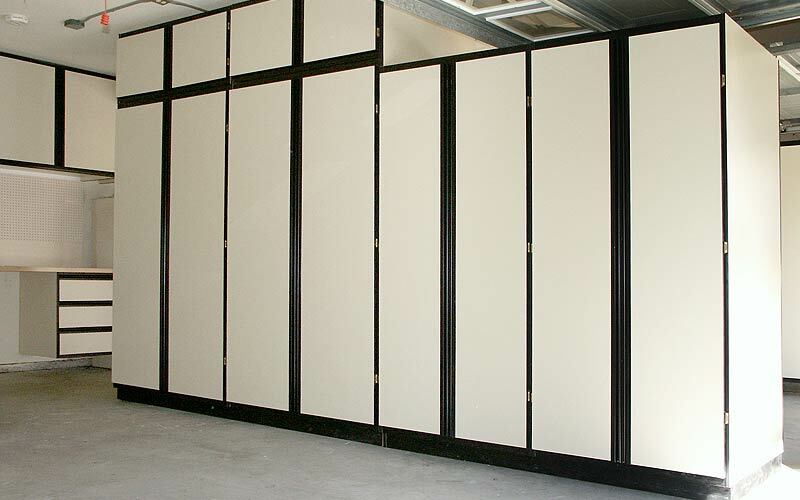 This double sided cabinet island consists of 2ft. 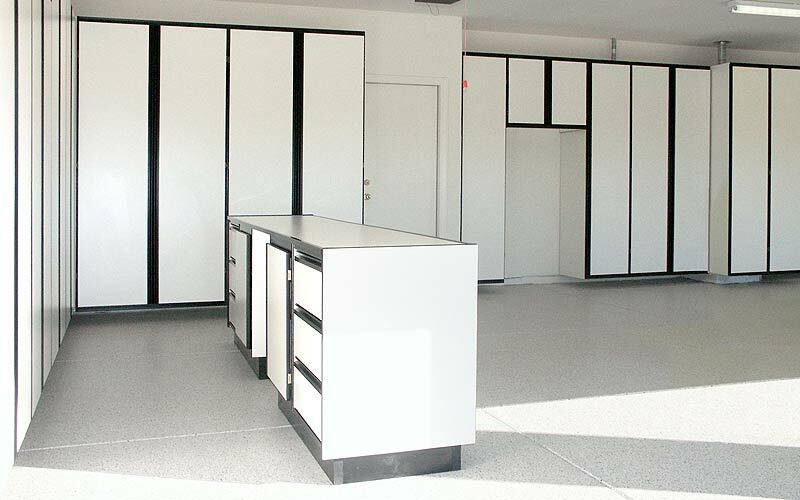 deep cabinetry back to back, then end-capped with a solid sheet of melamine. 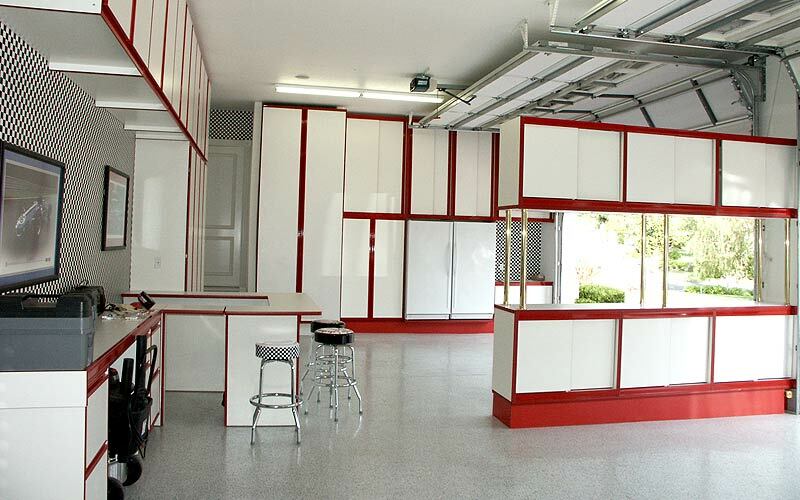 The island divides the single and double door openings to the garage and equals over 32ft. of cabinetry. 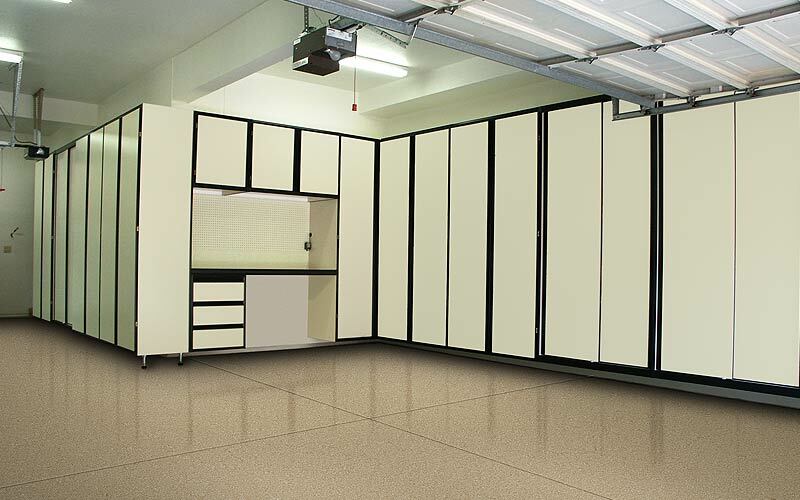 This design features grey melamine cabinets and a"Granite" finish epoxy floor. 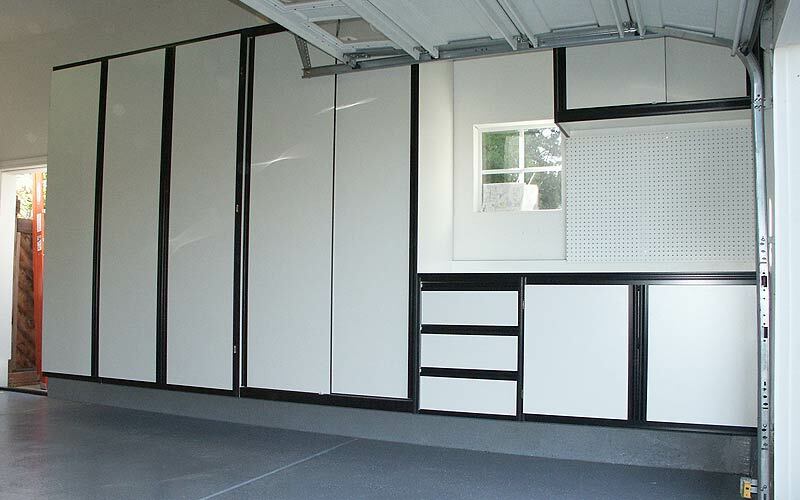 This garage features an island workbench, refrigerator alcove, enclosed waterheater/vac and a half cabinet side wall (not shown) to accommodate car door swing out. 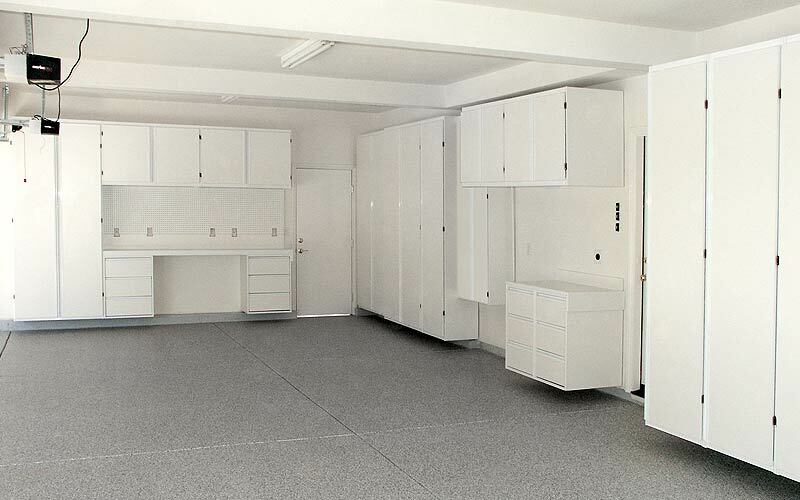 Shown here also is a "Grey" finish epoxy floor.